A tasty and healthy pie. This can be served as a side dish, as part of a buffet or as a delicious snack. 50g all-purpose flour kept separate in a bowl to be used when you roll out the dough. Peel the artichokes, discarding the outer leaves, until the soft inner leaves remain along with the heart. Lightly fry the chopped onions and sliced artichokes in a spoonful of butter for a few seconds. Add 3 tablespoons of water and simmer for 5 minutes. Put in a bowl and add the grated regatto cheese with the ricotta or anthotiro along with salt, pepper and chopped mint. Mix all the ingredients in a large bowl with enough water to make a pliable dough. Knead well and make a pliable dough. Cover with clingfilm and set aside to rest for 1 hour. Roll out each ball to the size of a medium oven dish, making it as thin as possible. 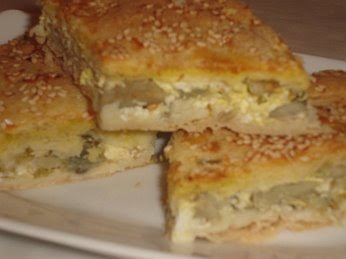 Place 3 layers of the filo pastry in an oven dish brushed with olive oil and brush in between each layer with olive oil. Place the other 3 layers of filo pastry on top, again brushing olive oil in between each layer and on top of the final layer. Lightly score the final layer in squares. Beat the egg and milk well and spread over the top of the pie. Bake in a pre-heated oven at 180 degrees Celsius for 45 minutes until the pie is a lovely golden colour and well-baked underneath. This looks absolutely amazing--I am a sucker for artichokes and cheese together. However, I am not familiar with the cheeses you have here--are they lower calorie and where can I find them?